Basal-like breast cancers (BLBC) are aggressive breast cancers for which, so far, no targeted therapy is available because they typically lack expression of hormone receptors and HER2. Phenotypic features of BLBCs, such as clinical presentation and early age of onset, resemble those of breast tumors from BRCA1-mutation carriers. The genomic instability of BRCA1-mutated tumors can be effectively targeted with DNA-damaging agents and poly-(ADP-ribose) polymerase 1 (PARP1) inhibitors. Molecular similarities between BLBCs and BRCA1-mutated tumors may therefore provide predictive markers for therapeutic response of BLBCs. There are several known molecular features characteristic for BRCA1-mutated breast tumors: 1) increased numbers of genomic aberrations, 2) a distinct pattern of genomic aberrations, 3) a high frequency of TP53 mutations and 4) a high incidence of complex, protein-truncating TP53 mutations. We compared the frequency of TP53 mutations and the pattern and amount of genomic aberrations between BRCA1-mutated breast tumors, BLBCs and luminal breast tumors by TP53 gene sequencing and array-based comparative genomics hybridization (aCGH) analysis. We found that the high incidence of protein truncating TP53 mutations and the pattern and amount of genomic aberrations specific for BRCA1-mutated breast tumors are also characteristic for BLBCs and different from luminal breast tumors. Complex, protein truncating TP53 mutations in BRCA1-mutated tumors may be a direct consequence of genomic instability caused by BRCA1 loss, therefore, the presence of these types of TP53 mutations in sporadic BLBCs might be a hallmark of BRCAness and a potential biomarker for sensitivity to PARP inhibition. Also, our data suggest that a small subset of genomic regions may be used to identify BRCA1-like BLBCs. BLBCs share molecular features that were previously found to be specific for BRCA1-mutated breast tumors. These features might be useful for the identification of tumors with increased sensitivity to (high-dose or dose-dense) alkylating agents and PARP inhibitors. Lobules and ducts within the normal human breast are lined with a double layer of epithelial cells: an inner layer of luminal cells and an outer layer of basal/myoepithelial cells that are in direct contact with the basement membrane. Transformation of different mammary epithelial cells results in considerable heterogeneity in breast cancer subtypes, giving rise to differences in clinical presentation, histology and response to therapy . Gene expression profiling has identified five molecular breast tumor subtypes: luminal A, luminal B, normal breast-like, human epidermal growth factor 2 (HER2/ERBB2) positive, and basal-like [2, 3]. In the clinic however, only immunohistochemistry data for estrogen receptor (ER), progesterone receptor (PR) and HER2 status are used to guide treatment choice . Approximately ~70-80% of all breast tumors are hormone receptor positive  and therefore sensitive to adjuvant endocrine therapy . These tumors classify mostly as luminal A/B breast tumors . The addition of trastuzumab to adjuvant chemotherapy considerably improved the outcome of HER2-positive breast tumors . However, approximately 10-20% of all breast tumors do not express hormone receptors or HER2, and are therefore insensitive to endocrine or trastuzumab treatment. Currently, the only treatment available for these triple-negative breast cancers (TNBCs) is cytotoxic chemotherapy . The TNBC group as defined by immunohistochemical staining consists for approximately 80% of basal-like breast cancers (BLBCs) as defined by gene expression profiling . BLBCs express luminal (CK19 and CK18) as well as basal cytokeratins (CK5/6, CK17 and CK14), suggesting that these tumors originate from an undifferentiated, dual-lineage stem/progenitor cell type. Furthermore, the TP53 gene is often mutated in BLBCs , and the gene expression profiles of TP53-mutated breast tumors show strong association with the BLBC subgroup . Consequently, BLBCs are aggressive tumors with an expansive growth pattern (pushing margins), a high proliferation rate, high relapse rates and poor survival. Moreover, BLBCs occur more frequently in premenopausal women than in postmenopausal women and are often difficult to detect by mammography or ultrasound . Although TNBC/BLBC has a relatively poor prognosis in the first five years after diagnosis, approximately 60% of patients - even without adjuvant chemotherapy - do not relapse, and after ~8 years of follow up have a high chance of being cured (reviewed in ). This indicates that within the TNBC/BLBC tumor group there is considerable heterogeneity in tumor behavior. At present however, all TNBC/BLBC patients are treated with cytotoxic adjuvant chemotherapy because there are no clinically useful prognostic and predictive markers to identify patients with aggressive, chemotherapy-sensitive TNBC/BLBC, leading to unnecessary exposure to chemotherapy of a substantial number of patients . In recent years it is becoming clear that phenotypic features of TNBC/BLBC may also apply to the majority of hereditary BRCA1-mutated breast tumors [12, 13]. Since BRCA1 function is required for homology-directed repair of DNA double-strand breaks (DSBs), BRCA1-mutated tumors and BRCA1-like BLBCs are predicted to be sensitive to DSB inducing therapy . Indeed, breast tumors from BRCA1-mutation carriers are sensitive to inhibition of DNA single-strand break (SSB) repair by poly(ADP-ribose) polymerase (PARP) inhibitors  and to chemotherapy that causes DSBs, such as platinum drugs, alkylating agents and topoisomerase I poisons [16, 17]. It will therefore be important to identify features of sporadic BLBCs  that may be useful as predictive biomarkers for response to DSB-inducing chemotherapy or PARP inhibitors. Known molecular features characteristic for BRCA1-mutated breast tumors are 1) a high degree of genomic instability due to homologous recombination (HR) deficiency , 2) a distinct pattern of genomic aberrations [19–22] 3) a high frequency of TP53 mutations and 4) a high incidence of complex, protein-truncating TP53 mutations [10, 23]. In this study, we determined to what extent these molecular characteristics of BRCA1-mutated tumors are present in BLBCs. To compare molecular characteristics of BRCA1-mutated tumors with BLBCs, we used data from two published tumor sets from the Netherlands Cancer Institute that were sequenced for TP53 and for which aCGH data was generated. The first dataset contains 27 BRCA1-mutated breast tumors and 17 luminal breast tumors (defined by expression profiling) that were previously described by Joosse et al . The luminal tumors from this study were designated luminal-J: J for Joosse. The second dataset from Horlings et al.,  contained 21 non-hereditary BLBCs and 31 luminal breast tumors that were part of a series of 295 breast tumor specimens  which were assigned to breast cancer subgroups according tot their gene expression profiles [2, 3]. For privacy reasons BRCA1-mutation status was not verified in the BLBCs, however, these patients did not have a family history of breast cancer. Luminal tumors from this study were labeled luminal-H, H for Horlings. Six luminal breast tumors were used in both the Joosse study and the Horlings study. TP53 mutation, ER/PR/HER2, CK56 staining pattern and age at diagnosis of all tumors are shown in Table 1. Tumor characteristics of BRCA1-related, Luminal-J, basal-like and Luminal-H breast tumors. TP53 mutations Bold: predicted truncating TP53 mutation (frameshift, splice, nonsense and in-frame insertions or deletions), plain text: hotspot mutations according to Walker et al. Italics, missense TP53 mutations predicted deleterious by the SIFT or EffectGroup3 algorithms. Immunohistochemistry data for TP53, ER, PR, HER2 and CK5/6; BRCA1-mutation; tumor type as determined by expression profiling; age at diagnosis. *The TP53 gene of the BRCA1-mutated, Luminal-J tumors were sequenced in a different laboratory than the BLBCs and the luminal-H tumors. Of the 6 overlapping tumors between Luminal-H and Luminal-J tumors a discrepancy occurs in 3 tumors: In luminal-H tumor 157 a R248W mutation is found and in corresponding Luminal-J tumor C002 an additional R110C and T55I mutations are found. In luminal-J tumor C057 a P98L mutation is found and corresponding luminal-H tumor 389 no mutations are found. In luminal-H tumor 240 a H179R mutation is detected and in corresponding luminal-J tumor C060 an additional T125 M mutation is found. For 21 BRCA1-mutated tumors, and 13 luminal-J tumors exons 2-9 of TP53 were previously sequenced . The abundance of the aberrant base was estimated from the sequence chromatogram from both the forward and reverse sequencing runs. When comparing mutation types found in the tumor groups, the influence of tumor heterogeneity was minimized by only including TP53 mutations that had an estimated abundance of >25% in the tumor DNA . For all BLBC and luminal-H tumors TP53 exons 2-11 (including +/- 30 bp outside each exon) were sequenced using AB 3730 DNA Analyzer (reference sequence NM_000546). Frameshift, splice and nonsense mutations and in-frame insertions/deletions are defined as "complex TP53 mutations". All missense mutations found in the BRCA1-mutated and luminal-J tumor groups were classified according to their predicted effect on p53 function as determined by the Sorting Intolerant from Tolerant algorithm SIFT; [27, 28], as used in the IARC TP53 database [29, 30]. Because no matched normal/germ-line DNA was available, some benign germ-line variants may have been identified as deleterious somatic mutations by SIFT. All TP53 missense mutations found in the BLBC and luminal-H tumor groups were classified to be deleterious or non-deleterious according to their predicted effect on TP53 function using "EffectGroup3"  as used in the IARC TP53 database. The 29 most common hotspot mutations (P < 0.001) identified by Walker and colleagues  are referred to as ''hotpot mutations'': K132, C135, P151, V157, R158, Y163, V173, R175, C176, H179, H193, Y205, Y220, Y234, M237, C238, S241, C242, G245, M246, R248, R249, G266, R273, P278, R280, D281, R282, and E285. For aCGH procedures of the BRCA1-mutated and luminal-J tumor groups: see Joosse et al., 2009 . For aCGH procedures of the BLBC and luminal-H tumor groups: see Horlings et al., . For the aCGH analyses, a microarray platform containing 3,500 human BAC/PAC clones covering the whole genome with an average spacing of 1 Mb was used . Although the 1 Mb resolution of the BAC platform limits sensitivity for focal changes, the aCGH data is a sound representation of our tumor groups and can be used to find recurrent differences between tumor groups. When comparing aCGH profiles of tumor DNA isolated from formalin-fixed paraffin-embedded (FFPE) tissue  and fresh-frozen tissue , we noticed that the log2-ratios obtained from the different DNA sources showed different distributions. From the six overlapping samples between the luminal-H and luminal-J tumor groups, as shown in Table 1 we saw that distribution of log2-ratios derived from FFPE samples was consistently wider than the log2-ratios derived from fresh frozen tissue (Additional File 1). Therefore, we transformed both the FFPE (i.e. all log2 ratios from BRCA1-mutated and luminal-J tumors taken together) and the fresh frozen datasets (i.e. all log2 ratios from BLBC and luminal-H tumors taken together) to have a mean of zero and a standard deviation of one before applying KC-SMART and comparative-KC-SMART. This enabled us to construct one luminal tumor group consisting of tumors from both the luminal-H and luminal-J tumor groups to compare the BRCA1-mutated and BLBC-data with. The six tumors that overlapped between the two groups were included only once and taken from the luminal-J tumor group. (Kernel Convolution - a Statistical Method for Aberrant Region detection) is a computational approach for statistical analysis of non-discretized aCGH data from multiple experiments, and determines which regions are significantly gained or lost relative to randomized data (P < 0.05) . We used KC-SMART to smooth the raw log2-ratios by generating a Kernel Smoothed Estimate (KSE) curves for gains (KSEgains) and losses (KSElosses) separately across a group of tumors. detects genomic regions that have a differential aCGH signal between two tumor groups. The comparative-KC-SMART algorithm smoothes raw log2-ratio data from each individual tumor profile by placing Gaussian kernel functions with the height of the log2-ratio at the genomic midposition of each probe (without separating gains and losses, as done for KC-SMART). For each tumor, an aggregated profile is determined by convolution of locally weighted kernel functions. For each genomic position, the KSE values from all tumors that belong to the two tumor groups in the comparison are used to calculate a signal to noise ratio (SNR). We determined a cut-off that defines significant SNR values by generating SNR data using 6000 class-label permutations and calculating the significance threshold corresponding with a False Discovery Rate (FDR) of 0.05. The width of a kernel applied to each data point determines the extent of smoothing and the size of aberrations detected. Smoothing individual tumors with a kernel width of 20 Mb resulted in aCGH profiles that recapitulated raw aCGH data well; therefore, we chose to use this kernel width for all comparisons. R-packages of KC-SMART and comparative-KC-SMART have been submitted to Bioconductor . We used NCBI Build 36 (Hg 18) for these analyses. We used the MeV program  to cluster tumor aCGH data. Samples and genes are hierarchically clustered using pearson correlation and complete linkage with leaf ordening. We previously found that nearly all BRCA1-mutated breast tumors had deleterious TP53 mutations due to an increased frequency of truncating frameshift, splice, nonsense mutations and in-frame insertions and deletions . BRCA1-mutated tumors and BLBCs are both basal like TNBCs, characteristics that are different from hormone receptor positive luminal breast tumors (Table 1). Therefore, we were motivated to compare TP53 mutation type and frequency found in non-hereditary BLBCs, in BRCA1-mutated tumors and in luminal breast tumors. TP53 mutation types and other tumor characteristics are listed in Table 1. The TP53 gene from the BRCA1-mutated/luminal-J tumors and the BLBC/luminal-H tumors were sequenced in different labs with slightly different methods (see Methods section). At the cost of reducing the power of this analysis we wanted to make sure we did not introduce a methodical bias in our comparisons, therefore, the TP53 mutation data for luminal-J and luminal-H tumors were not combined. Similar to the 90% (19/21) of BRCA1-mutated tumors, 95% (20/21) of the BLBCs harbored TP53 mutations, significantly more than the 46% (6/14) of the luminal-J and the 26% (8/31) of the luminal-H tumors (p = 7 × 10-3 and p = 5 × 10-7 respectively, two-tailed Fisher's Exact test), Figure 1 Additional File 2. We next compared TP53 mutation types from BRCA1-mutated tumors and non-hereditary BLBCs with luminal-H and luminal-J tumors. We found that 52% (11/21) of the BRCA1-mutated tumors and 57% (12/21) of the BLBCs have complex/truncating TP53 mutations, which is significantly more than the 8% (1/13) and 7% (2/31) of the luminal-J and luminal-H tumors, respectively (p = 1 × 10-2 and p = 8 × 10-5 respectively; two-tailed Fisher's Exact test, Figure 1 Additional File 2), indicating that this feature is common in hereditary BRCA1-mutated breast tumors and non-hereditary BLBCs. Interestingly, the increase in deleterious missense or hotspot TP53 mutations in BRCA1-mutated or BLBCs (8/21) their respective luminal tumor groups was not significant. Deleterious missense mutations: 11/21 BRCA1-mutated vs. 5/13 luminal-J, p = 5 × 10-1, and 8/21 BLBCs vs. 6/31 luminal-H tumors p = 2 × 10-1, two-tailed Fisher's Exact test). Hotspot mutations: 9/21 BRCA1-mutated vs. 3/13 luminal-J, p = 3 × 10-1, and 6/21 BLBCs vs. 6/31 luminal-H tumors p = 5 × 10-1, two-tailed Fisher's Exact test). Together, these data suggest that the increase of TP53 mutations in the BRCA1-mutated tumors and BLBCs is primarily due to the increase in complex/truncating TP53 mutations. Analysis of TP53 mutations in BRCA1-mutated tumors and BLBCs. TP53 exons 2-9 were sequenced for 21/27 of the BRCA1-mutated tumors and for 13/21 of the luminal-J tumors. TP53 exons 2-11 were sequenced for all 21 BLBCs and 31 luminal-H tumors (see Table 1 for TP53 mutations see Additional File 1 for TP53 mutation frequencies). a. Amount of tumors with at least one TP53 mutation. b. Amount of tumors with at least one complex, predicted truncating TP53 mutation (frameshift, splice and nonsense mutations and in-frame insertions/deletions). c. Amount of tumors with at least one deleterious missense mutation. d. the amount of tumors with at least one hotspot mutation as defined by Walker et al. Three BRCA1-mutated tumors have a complex/truncating TP53 mutation and also a deleterious missense mutation. * Significant difference between groups (p < 0.01, determined with a Fisher's Exact Test), ns: no significant difference between groups. To identify DNA copy number aberrations (CNAs) that occur significantly more often in BRCA1-mutated breast tumors than in BLBCs, we analyzed their aCGH with comparative-KC-SMART, a computational method for detection of genomic regions that have a significantly different aCGH signal between two tumor groups. However, the DNA samples used to acquire aCGH profiles for the BLBC and the BRCA1-mutated tumor groups were isolated from fresh frozen tissue and FFPE material respectively, resulting in differences in log2-ratio distribution of the aCGH profiles (Additional File 1). 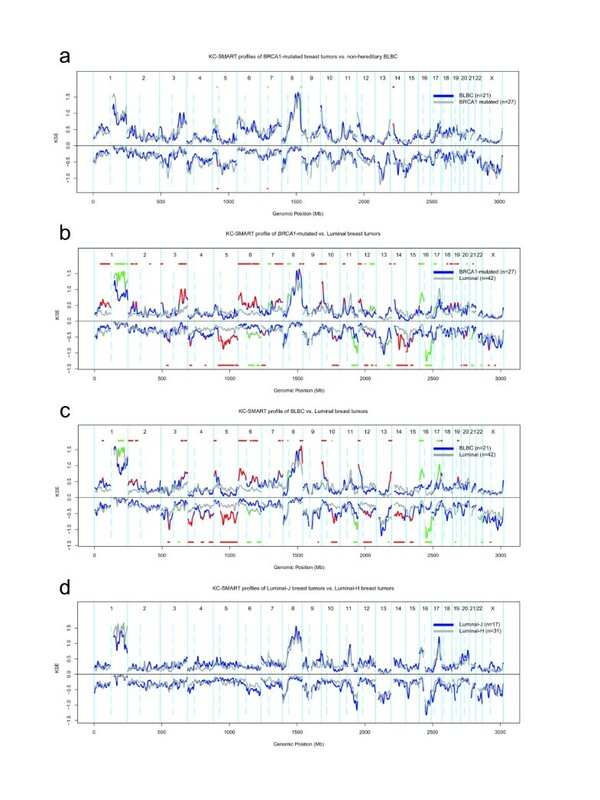 To account for this difference, we normalized the data as explained in the Methods section. 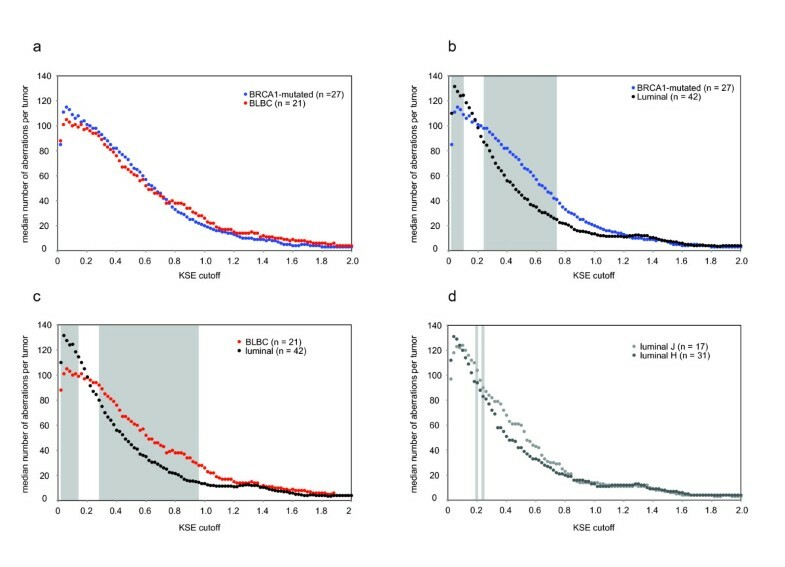 We applied comparative-KC-SMART to the normalized aCGH data of the BRCA1-mutated tumor group and the BLBC group (Figure 2a). Comparative-KC-SMART detected small CNAs on chromosomes 5, 7, 8 and 14 that are significantly different between these tumor groups (for regions and cancer-related genes see Additional File 3). BRCA1-specific losses and BLBC-specific gains on chromosomes 5 and 7 flanked each other and seem to be dependent on each other. Interestingly, the BRCA1-specific chromosome 7 loss encompasses EGFR. The BRCA1-specific gain on chromosome 14 peaks at the T-cell receptor alpha (TCRα) locus and encompasses, among other cancer-related genes, poly(ADP-ribose) polymerase 2 (PARP2), and B-cell lymphoma 2 like 2 (BCL2L2). Whether any of the genes located within these CNAs promote survival of BRCA1-deficient cells remains to be established. Comparative-KC-SMART analysis of aCGH data from BRCA1-mutated tumors and BLBCs. For each tumor group, comparative-KC-SMART was applied to normalized aCGH data, which was scaled to have a mean of zero and a standard deviation of one. The KSE curves for each tumor group are shown for gains and losses separately. a: BRCA1-mutated breast tumors (blue) vs. BLBCs (gray). CNAs that occur more often in the BRCA1-mutated tumors vs. the BLBCs are shown as red horizontal bars on above or below the KSEgains and KSElosses respectively, and they are plotted as red overlays on the blue KSE curves. CNAs that occur more often the BLBCs vs. the BRCA1-mutated tumors are shown as green horizontal bars above or below the KSEgains and KSElosses respectively, and as green overlays on the gray KSE curves. b: BRCA1-mutated tumors (blue) vs. luminal tumors (gray) c: BLBCs (blue) vs. luminal (gray) tumors. d: Luminal-J tumors (blue) vs. luminal-H tumors (gray). Next, we used comparative-KC-SMART to compared CNAs in the BRCA1-mutated tumors and BLBCs vs. the combined luminal tumors (Figure 2b-c). Differential gains and losses are shown in Additional File 4. We compared CNAs between Luminal-J and luminal-H tumors as a control for merging these tumor groups (Figure 2d): as expected, no differences between the two luminal groups were detected. Gains on chromosomes 1q and 16p, and the loss on chromosome 16q occur more often in the luminal tumors than in the basal-like/BRCA1-mutated tumors (Figure 2b-c, Table 2). The first chromosome 1q gain peaks at 177.31 Mb; the second 1q gain peaks at 202.65 Mb close to MDM4 (202.81 Mb). Similarly, the 16p gain peaks at 15.7 Mb. The chromosome 16q loss consists of two peaks: the first peak maps to 52.19 Mb, at the BRD7, CYLD, and RBL2/p130 genes. The second peak maps to 79.19 Mb, at one of the most active common fragile sites in the human genome, FRA16 D, associated with the WWOX gene (77.24 Mb). Many of the luminal tumors show a co-occurrence of chromosome 1q gain and 16q loss (Additional File 5). Table 2: a. Overlapping differential CNAs of BLBCs and BRCA1-mutated breast tumors vs luminal breast tumors. b. Overlapping differential CNAs of luminal breast tumors vs BRCA1-mutated breast tumors and BLBCs. Differential gains and losses determined by comparative-KC-SMART (Figure 1b-c). a) Overlapping regions that differentiate BRCA1-mutated tumors and BLBCs from luminal tumors. b) overlapping regions that differentiate luminal-J and luminal-H tumors from BLBC/BRCA1-mutated tumors. KSE peak locations are listed for all tumor groups; peaks in italics fall just outside the region of overlap. Because BLBCs and BRCA1-mutated tumors are almost always TP53-mutated, we investigated whether TP53 mutations are associated with specific CNAs in luminal tumors. We stratified the 31 luminal-H tumors by their TP53 mutation status and used comparative-KC-SMART to compare both tumor groups. Although no differences were detected between CNAs from 8 TP53-mutated and 23 TP53 wild-type luminal breast tumors, quantitative differences in KC-SMART profiles can be observed, Figure 3. TP53-mutated tumors have more overall gains on chromosomes 3q, 6p, 20q, 21q and 22q and losses on chromosomes 2q, 3p, 4p, 4q, 13q, 15q and X. On the other hand, TP53 wild-type tumors have a higher incidence of chromosome 1q gain, and 16q loss. However, these data do not provide evidence for an altered profile of TP53-mutated luminal breast tumors, perhaps because the TP53-mutated tumor group is too small for robust statistical analysis. Comparative-KC-SMART analysis of aCGH data from luminal breast tumors. The luminal-H tumor group was divided into 8 TP53-mutated tumors and 23 TP53 wild-type tumors. KSE curves of the TP53-mutated tumors (blue) and the TP53 wild-type tumors (gray) are shown for gains and losses separately. Comparative-KC-SMART analysis did not detect significant differences between the two tumor groups. To determine the amount of CNAs in the different tumor groups, we used KC-SMART to smooth individual aCGH profiles and counted the amount of CNAs exceeding a range of cutoffs for each tumor separately. We found that the median amount of CNAs of BRCA1-mutated tumors was not different from the amount of CNAs found in BLBCs (Figure 4a). In contrast, we found that the median amount of CNAs is significantly greater in the BRCA1-mutated tumors compared with luminal breast tumors between KSE cutoffs 0.02 and 0.1 and between 0.24 and 0.74 (P < 0.01, two sided t-test Figure 4b). Similarly, the median amount of CNAs in the BLBCs was higher compared with luminal tumors for KSE cutoffs between 0.02 and 0.14 and between 0.28 and 0.96 (Figure 4c). We did not detect differences in the median amount of aberrations between luminal-J breast tumors and luminal-H except for KSE cutoffs 0.2 and 0.24 (Figure 4d). Median number of aberrations. a: Median amount of aberrations of BRCA1-mutated tumors and BLBCs. Normalized aCGH profiles from individual tumors were smoothed using KC-SMART (kernel width: 20 Mb) for a range of thresholds (KSE cutoff, x-axis). Gains exceeding a positive threshold and losses exceeding the same negative threshold were counted and the median was calculated over each tumor group. Gray background indicates thresholds for which the average number of CNAs in the BLBC group is significantly different compared with the luminal tumors, calculated with a two sided t-test (P < 0.01). Median amount of aberrations of (b) BRCA1-mutated tumors (blue dots) and luminal tumors (black dots); (c) BLBCs (red dots) and luminal breast tumors (black dots); (d) luminal-H (dark gray dots) and luminal-J tumors (light gray dots). We compared gains and losses specific for the BLBC/BRCA1-mutated tumor groups relative to the luminal tumor groups. The BLBC/BRCA1-mutated tumors harbored overlapping differential gains on chromosomes 1p, 2p, 3q, 6p, 6q, 7q, 8q, 10p, 12p, 13q and 19q and losses on chromosomes 3p, 4p, 5q, 10q, 12q, 14q and 15q. The luminal tumor groups contained overlapping gains on chromosomes 1q, 8p and 16p, and an overlapping loss on chromosome 6q, 11q, 13q and 16q (Table 2). Clearly, the differentially occurring CNAs detected by comparative-KC-SMART are fully dependent on the tumors included in the groups. However, when peaks of recurrent aberrations of two different analyses map closely together, this could point to a region whose gain or loss is relevant for tumorigenesis. 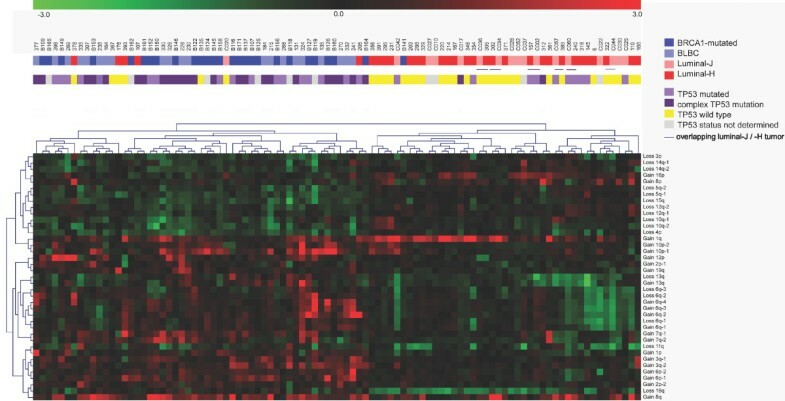 Cancer-related genes that map to overlapping differential gains or losses between BRCA1-mutated tumors and BLBCs vs. luminal tumors are shown in Additional File 6. The overlapping differential gains and losses of BLBCs and BRCA1-mutated tumors may represent regions that discriminate BRCA1-mutated tumors and BLBCs from luminal tumors. To test this possibility, we performed an unsupervised hierarchical clustering analysis. First, we smoothed each tumor profile with KC-SMART to remove experimental noise. Then, for each of the regional aberrations specific for the BLBC/BRCA1-mutated tumors or the luminal tumors (shown in Table 2), we calculated the mean of all KSE values within the region for all tumors. We used the mean KSE values to perform a hierarchical clustering of samples and regions using complete linkage and pearson correlation (Figure 5). The tumors clustered in two branches: 6 luminal tumors and 47 of the 48 BLBCs/BRCA1-mutated tumors clustered in one branch, whereas 1 BRCA1-mutated tumor and 42 of the 48 luminal-H/J tumors clustered in the other branch. Interestingly, the BRCA1 and BLBC cases do not form separate clusters but mix together, meaning that a limited amount of regions can distinguish BLBCs and BRCA1-mutated tumors from luminal tumors. The fact that the luminal-H and luminal-J tumors are mixed, shows that no unwanted biases are introduced by differences in quality of DNA from FFPE vs. fresh-frozen tumor material. As an additional internal control we have used the 6 luminal tumors for which DNA from FFPE and fresh-frozen tumor tissue was both available, and each of the 6 pairs cluster together. Notably, four of the six TP53 wild-type tumors that clustered within the BLBC/BRCA1-mutated branch were luminal. One of the six luminal tumors that clustered within the BLBC/BRCA1-mutated branch also had a complex TP53 mutation, whereas only two of the luminal tumors clustering in the luminal branch had a complex TP53 mutation. Clustering analysis. Unsupervised hierarchical clustering of 27 BRCA1-mutated tumors, 21 BLBCs, 17 luminal-J tumors and 31 luminal-H tumors. For each individual tumor, a KSE curve was calculated by smoothing each tumor profile with KC-SMART. A mean KSE value for was determined for all overlapping regions of gain and loss (shown in Table 2) between BLBCs (light blue) and BRCA1-mutated tumors (dark blue), and for the overlapping regions between the luminal-H (red) and luminal-J (pink) groups. We used two-dimensional Pearson correlation to perform complete linkage clustering over the mean KSE values and tumors. BLBC is an aggressive subgroup of breast cancers for which, so far, no druggable target has been identified. In recent years it has become clear that phenotypic features of a subset of BLBCs resemble those of hereditary BRCA1-mutated breast cancers  and are distinctly different from the more common luminal breast tumors. BRCA1-mutated breast tumors are HR deficient (HRD) and can therefore be targeted with DNA-damaging agents or PARP inhibitors [38, 39]. Because there is evidence that a substantial fraction of BLBCs have HR pathway defects , we set out to determine which molecular characteristics of BRCA1-mutated tumors are common to BLBCs but not to luminal tumors. Since some of these characteristics are likely to be linked to BRCA1-disfunction or the HRD phenotype, they might provide important leads for discovery of new biomarkers or drug targets. We and others have previously shown that BRCA1-mutated breast tumors exhibit an increased frequency of TP53 mutations due to a selective increase in complex TP53 mutations such as frameshift, nonsense and splice mutations or in-frame insertions/deletions [10, 23]. In this study, we found that almost all BRCA1-mutated tumors and BLBCs are TP53 mutated compared with 25-50% of the luminal-tumors. Interestingly, 52.4% of the BRCA1-mutated breast tumors and 57.1% of the BLBCs have complex TP53 mutations, significantly more compared with ~7% luminal tumors. It has been suggested that the increased incidence of complex TP53 mutations in BRCA1-mutated tumors is a direct consequence of the genomic instability resulting from the DNA repair defect induced by BRCA1 loss [10, 23]. Furthermore, the DSB repair defect of BRCA1-deficient tumors might confer strong selection pressure on mutation of TP53 in order to abrogate the p53-dependent DNA damage checkpoint . The high frequency of TP53 mutations in non-hereditary BLBCs might suggest that these tumors are also compromised in homology-directed DSB repair. To test this possibility, it would be interesting to perform functional assays to measure DNA damage response and DNA repair in non-hereditary BLBCs with a (complex) TP53 mutation. It has previously been suggested that TP53 mutations, including complex TP53 mutations, affecting the DNA binding domain of the p53 protein may cause resistance to several different cytotoxic compounds such as anthracyclins, 5FU and mitomycin [42, 43]. However, tumors used in these studies were primarily invasive ductal carcinomas, most of which are likely not compromised in homology directed DSB repair. It is therefore interesting that Silver et al. recently reported a significant association between truncating TP53 mutations and cisplatin response in TNBCs . It is interesting that, like us, Manie et al., found an increased frequency of complex TP53 mutations in BRCA1-mutated breast tumors; however, they did not detect this feature in BLBCs [10, 23]. It is possible that BLBCs are more effectively identified by gene expression profiling than by immunohistochemical selection of tumors negative for ER/PR/HER2 and positive for CK5/6, CK14 or EGFR, as done by Manie et al. Of note, the TP53 mutation analyses for the BRCA1-mutated breast tumors and the BLBCs described in this manuscript were performed in different labs, thereby reducing the possibility that the detection of a high incidence of complex/truncating TP53 mutations is due to a methodical artifact. Luminal breast tumors are mostly TP53 wild type, or they have a common TP53 hotspot mutation. Interestingly, the chromosome 1q gain and 16q loss (1q/16q) differentiate luminal tumors from BRCA1-mutated/BLBC tumors. Co-occurrence of these aberrations results from an unbalanced translocation event [45, 46] and has been associated with TP53 wild-type status, low tumor grade and good prognosis . Indeed, many of the ER-positive luminal tumors show the 1q/16q co-occurrence. The peak of the chromosome 1q gain of the luminal tumor group maps to 202.75 Mb, with the MDM4 gene at (202.81 Mb), which is a negative regulator of p53 . The 16q loss has two peaks, the first maps near the bromodomain 7 (BRD7) gene, associated with downregulation of p53 , CYLD, loss of which is associated with oncogenesis by activation of NF-ΚB signaling , and the retinoblastoma-like 2 gene (RBL2/p130), involved in G1S cell cycle control and senescence . The second peak on the 16q loss maps to one of the most active common fragile sites in the human genome, FRA16 D (associated with the WWOX gene), which could underlie the translocation process . 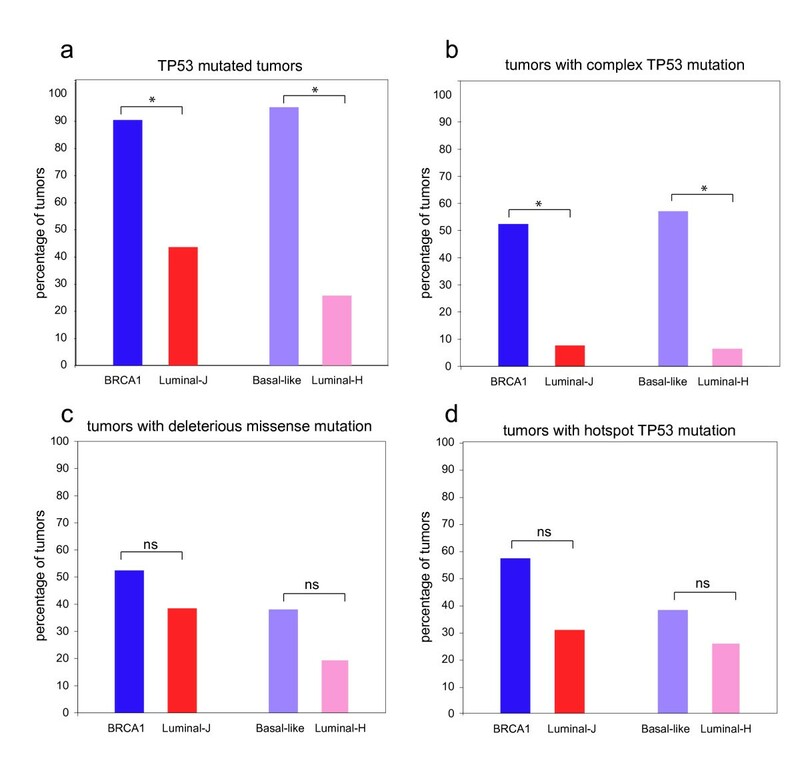 Together, these data suggest that, whereas development of BLBCs or BRCA1-mutated tumors depends on TP53 mutation, indirect p53 downregulation may be sufficient for luminal tumor development. BRCA1-mutated breast tumors are associated with a specific aCGH profile which exhibits features that can be used to identify hereditary breast tumors for which information on BRCA1-mutation is not available [19, 22, 24]. Several previous studies have reported a specific aCGH profile for BLBCs different from other breast cancer subtypes [53, 54]. Interestingly, comparison of CNAs from BRCA1-mutated tumors and BLBCs using comparative-KC-SMART yielded a limited set BRCA1- or BLBC-specific aberrations. The peaks of most gains and losses of BRCA1-mutated tumors and BLBCs co-localized, suggesting a common selection pressure during development of these tumors. Indeed, we found that BRCA1-mutated tumors and BLBCs showed many overlapping CNAs, including the chromosome 3q gain and the chromosome 5q loss. Importantly, clustering on the basis of these regions separated BLBCs and BRCA1-mutated breast tumors from luminal breast tumors. Our data show that BRCA1-mutated tumors share molecular characteristics of undifferentiated BLBCs. It has previously been proposed that BRCA1-mutation is associated with BLBC because BRCA1 function has stem cell regulation properties and because loss of BRCA1 impairs DNA damage repair during epithelial cell differentiation . However, it is also possible that a defect in DNA repair mechanisms is primarily harmful in proliferating cells, which are more prone to acquire genetic lesions during cell division. Notably, proliferating cells in the premenopausal mammary gland have been shown to rarely express hormone receptors whereas hormone receptor-positive cells only rarely divide . In line with this, and in contrast to most breast tumors, both BRCA1-mutated tumors and BLBCs often occur in premenopausal breast epithelia . Therefore, we propose that inadequate DNA repair mechanisms result in increased susceptibility to genomic instability in the proliferating hormone receptor-negative cells of the premenopausal mammary gland. Furthermore, we propose that because of this, hormone receptor-negative cells depend heavily on p53-mediated cell cycle arrest and apoptosis to remain untransformed. This line of thought lends great importance to TP53 mutation in TNBC. Our data suggest that a small subset of genomic regions may be useful for the identification of BRCA1-like BLBCs, which exhibit a high frequency of TP53 mutations, especially protein truncating mutations. These features of basal-like breast cancers might be useful for the identification of tumors with increased sensitivity to (high-dose or dose-dense) alkylating agents and PARP inhibitors. In support of this, it was recently reported that TP53 mutations in non-inflammatory BLBCs are highly predictive of complete response to dose-dense neoadjuvant chemotherapy with epirubicine-cyclophosphamide . Furthermore, a significant positive correlation was found between truncating TP53 mutations and cisplatin response in TNBCs . Together, these and our data support further investigation of (protein truncating) TP53 mutation status as a potential predictor of chemotherapy responsiveness in solid tumors. This work was supported by grants from the Dutch Cancer Society (NKI 2002-2635), the Netherlands Organization for Scientific Research (NWO Vidi 917.036.347) and the Susan G. Komen Breast Cancer Foundation (BCTR0403230). The authors thank Dr. Sabine Linn for sharing her expert view on this subject and Dr. Piet Borst and Dr. Hein te Riele for critically reading this manuscript. HH (first author) designed, performed the analyses and wrote the manuscript, HH (second author) and MJV provided tumor information of the Horlings tumor panel . AV provided help with statistical analyses and performed the bioinformatics. AL and ALB-D sequenced TP53 from the tumor panel described by Horlings et al  and helped with TP53 mutation interpretation, PN provided tumor information from the Joosse tumor panel . JJ supervised the project. All authors read and approved the manuscript.